Our range of products include neem cake (powder), neem cake pellets, de- oiled neem cake and neem cake (granular). Neem Cake is the Future of Farming in Indian and abroad. We have developed a unique Neem Cake formulation which contains more Nitrogen, Phosphorous, Calcium and Magnesium than farm yard manure or sewage sludge. 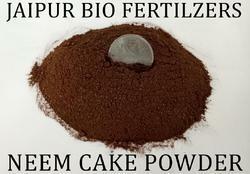 Neem Cake Organic Manure is very effective on growth, yield and quality of agricultural crops. 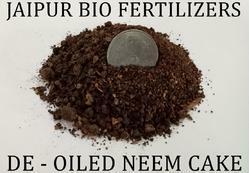 There is significant improvement in soil health in all plants treated with Neem Cake. The organic carbon contents increased with increase in dose of Neem Cake manure. Soil moisture content is increased during crop growth period with the application of Neem Cake Organic Manure. Plant growth parameters viz. terminal shoot growth, plant girth, height and spread were significantly effected by Neem Cake Organic Manure treatments. It was also observed that in Neem Cake Organic Manure treatment fruit pressure and titratable acidity was recorded maximum. 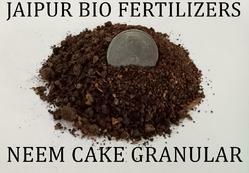 Neem Cake Organic Manure can be used on its own as a fertilizer, but works most effectively when incorporated into the soil along with nitrogen fertilizer. Nematode control: The nematodes such as Haplolaimus indicus Helicotylenchus Sp, Pratylenchus Sp, Meloidogyne incognita, M. javanica (root knot nematode).Tylenchorhynchus Sp and Rodopholus similis are being controlled by this Neem Cake product. It also control parasitic fungi such as R. brassica. Insect pest control: This product also controls Grain moth, lesser grain moth and red flour beetle. Increase in Earthworm population: Places where Neem Cake Organic Manure is used, increase in earthworm population is found. Induces nitrification: Induces the nitrification process and the chlorophyll contents gets increased. 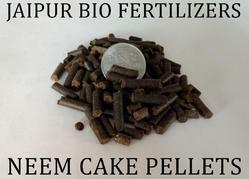 Neem Cake Organic Manure, provides more and more nitrates for the plants which in turn induces the nitrogen metabolism. Releases Acid, aldehydes etc. : This also releases fatty acids, aldehydes, Ketones, Aminoacids, carbohydrates and free sulphur, which forms the precursor material for plant growth and metabolism. 1. Powder - Particle Size 200 Mesh. This is a good basal dressing. 1. Pellet - 3 mm dia to 5-8 mm length. 1. Granular - Particle Size 5mm. This may be spread with mechanical devices. Looking for De Oiled Neem Cake ?